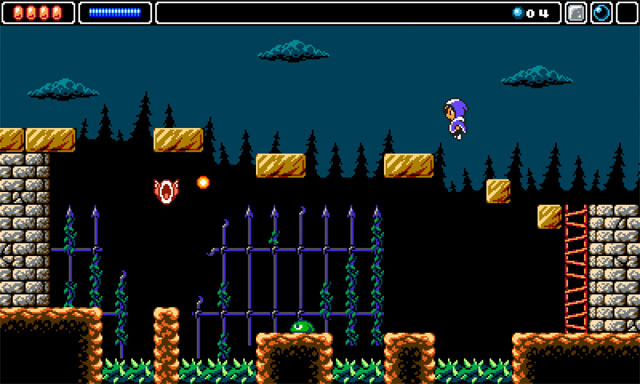 A development team made up of Mikael Forslind, Kevin Andersson, Robert Kreese, and Alexander Berggren (game site) brings you Alwa's Awakening, a game about a girl named Zoe who gets sucked into an NES game and finds herself in the land of Alwa. The game is a sidescrolling action adventure and sees Zoe battling undead creatures, dodging environmental obstacles, and navigating spike-filled landscapes. Zoe must use her magic abilities to make her way through the world, including the ability to create a bubble that she can use to float to higher platforms, and the creation of blocks that she can use as stepping stones. The game is coming to PC, Mac, and Linux via Steam this winter.